(Makes 5 gallons) Erik Beer was the president of the local homebrew club, Doze, for a number of years. 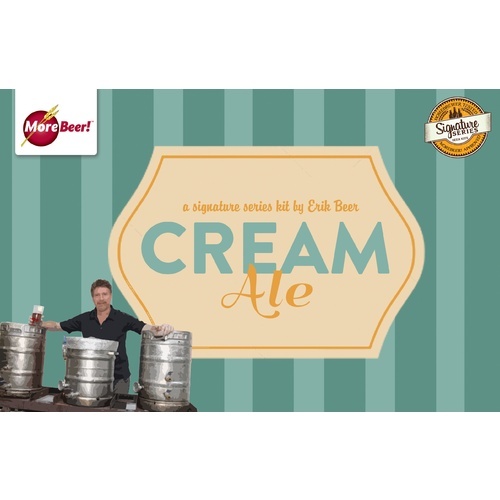 During that time he created and perfected recipes for a number of different brews, this easy-drinking Cream Ale being one of them. Featuring a blend of Pale and Pilsener Malt with some Flaked Maize thrown in to lighten things up, this beer is sure to be a hit. Hopping is light on this, but definitely enough to balance things and make this brew go down smooth. Have drank this before...very good!!!! 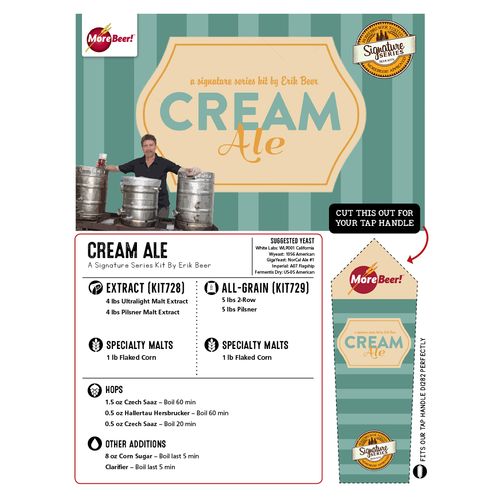 It sounds like a good cream ale, perfect for summertime in Georgia! Loooove Mother Earth Brewing's Cream Ale. Can't wait to try this. I brewed this beer and before I even bottled it the flavor was great. I do not want to run out so I must brew more. Great beer. I tweaked it a little to try something different and will definitely brew it this way again. Recommend! Made it twice. Shared with friends last weekend. Even the non-beer drinkers loved it. Ordering another kit now before the last bottles are gone! Full disclosure: I don't think I added enough water to primary, maybe 1/2 to 3/4 of a gallon less than 5 gallons. At 3 weeks, this beer is brown in color, and has this cloyingly sweet alcoholic finish in taste. It is more malty and porter-y in flavor. I know it's tough to rate a beer when so much of it is the brewer and what they did to it, but I just can't imagine that this is the same beer that others are describing in their reviews. It is not refreshing, it is not easy to drink, it is not a simple summer beer at all. Perhaps in time I will come to love it, but it's just taking up space in my kegerator right now. I'll revisit it in a few weeks and update this review, but I definitely won't be brewing this beer again any time soon. My first batch of home brewed beer.... very tasty!!! Will make more!!! My go to summer brew!! This kit is a fantastic beer. Ive brewed it twice with great results, it hardly lasts me more than a month. It is refreshing and you can taste the corn!. I recommend this to anyone who likes crisp clean full bodied beer! I crack the bottle as soon as it was supposed to be ready and wasn't too thrilled. I let it chill in the fridge for a week and oh man did it taste great. I got great feedback from everyone who tried it. I will definitely reorder this one. After a week in primary, I read about a Jalepeno cream ale recipe. I roasted 4 peppers, cut them up, soaked in vodka for a hour or two, and added to primary for 2 weeks. I bottled yesterday. The uncarbed beer was drinkable right out of primary. I can hardly wait to try it in 2 weeks. I tried the first bottle after a week, something that I rarely do because I usually wait 2 or 3 weeks. It is already off the hook! Somewhat spicy though it will tone down after a few weeks in the bottle. Very, very impressive. For me, this ranks up with the Nut Brown Ale extract kit that I made a year ago. This was one of the several brews for my buddy's wedding I did. Surprising... this was one of the favorites. 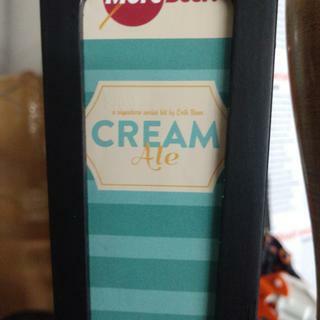 I can see why this made the discuss of great cream ales at the MoreBeer! warehouse. It bridged the gap of bud drinkers and craft beer. I think next time I will brew it with a fruit flavor like the laughing dogs huckleberry cream ale. My wife and I went to a beer festival and asked how our favorite beer was made. Coffee and cream ale. So we ordered 2 of these kits. Added three cups of coffee to the fermentor just before bottling, and let it sit two weeks. Even though we tested the coffee flavor out before adding the coffee, the coffee flavor was a bit heavy so we did the next batch with 2 cups of coffee. We enjoyed the flavor so much that we ordered two more kits. My wife likes the beer without the coffee flavor as well. The second two kits accepted three pounds of malt each to raise the alcohol which added a little more sweet taste to the beer. I love the light color of this beer, and enjoy a slightly sweeter flavor from the added malt over the hoppy beers. I found a 24 oz bottle this last weekend of the coffee cream ale in the back of the fridge from about three months ago and opened it. My wife put a shot of sambuca (sambvca is a liquorish flavored liquer) into the glass and people were asking for more. It seems the longer this beer stays in the bottle, the better it gets. After I am done with my Octoberfest and Thanksgiving beers which I have brewed for a halloween party, I will be heading back to this beer. It is always nice on Halloween evening to brew up some beer in the front yard as the kids come up to trick or treat.